← The Kirkin’ is just around the corner! John Knox, the reformer of the Church of Scotland which gave rise to the Presbyterian Church, was drawn to the book of Ezekiel as a model for his ministry. He used an image from the prophet for his first book title, The First Blast of the Trumpet. Like Ezekiel, Knox had been given a message and knew he must deliver it regardless of the danger the message brought upon himself. 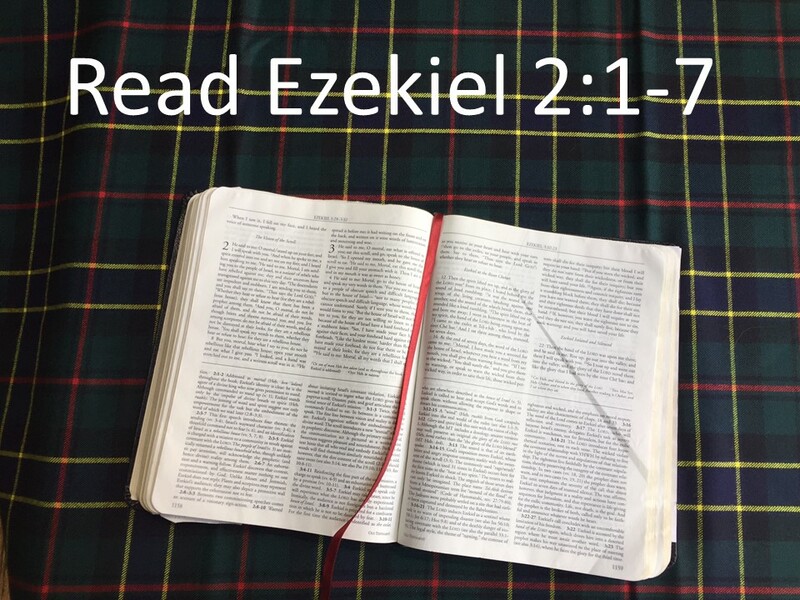 Today, in our sermon, on this Scottish Heritage Sunday, we’re going to look at Ezekiel’s call as a prophet and compare it to Knox’s call as a Reformer. Before we delve into the text, let me tell you a bit about Ezekiel. He was a young Hebrew priest exiled to Babylonian in 597 BC, that’s ten years before Jerusalem fell. The Babylonians had threatened Jerusalem in 597, but had not destroyed the city as they did in 587 BC. Instead, they allowed the city to continue as long as the king promised to be loyal to Babylon. The king in Jerusalem became a puppet. As a way to assure that this would be a good working relationship, the Babylonians took with them some young Hebrew men, which included Ezekiel and Daniel, back to Babylon to be schooled in the ways of the empire. While there in Babylon, Ezekiel is called to be a prophet. At home, back in Jerusalem, Zedekiah, the king, decided he didn’t like this arrangement with Babylon and aligns himself with the Egyptians, enemies of Babylon. This angers Babylon and in 587 BC, they return to Jerusalem and after a horrible siege, take the city and destroy it, sending even more of the Hebrew people into exile. In the late 1550s, John Knox was settling in to a comfortable life in Geneva. He was the pastor of an English-speaking congregation, which consisted mostly of religious exiles the British Isles. He’d made a dangerous trip back to Scotland, from which he had been banished from the previous decade. Love has a way to lead us to take such risks, as we went back to marry Marjorie Bowes. While in Scotland, he couldn’t help but do some preaching and meeting with Scottish leaders, many of whom were ready for a change of the church. This was a time of great uncertainty and Knox knew that if he wasn’t careful, he could end up being roasted while tied to a stake. But once back in Geneva, with his wife who soon became pregnant, things were looking up. 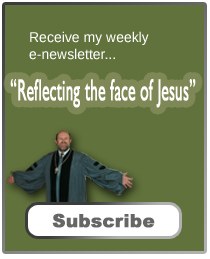 He was enjoying pastoring the church and studying under John Calvin, who was at his prime. BUT THEN he received a letter. The letter had been brought to Geneva by a Scottish merchant and had been signed by a number of Scottish nobles. They encouraged Knox to come back to Scotland. They were not able to promise him safety or a comfortable life, but they did promise a willingness to jeopardize it all—their lives, their estates, and their titles—for God’s glory. Knox was troubled. He shared this calling with his congregation, as well as with John Calvin and other pastors in Geneva. Everyone agreed. Knox had no choice. He was being called back to Scotland and if he refused, he would be rebelling against God. So much for safety and raising his son by Lake Geneva. When we are called by God, we’re called out of our comfort zones. We’re called to take risks. God’s call changes us. No one who answers it will ever be the same. Ezekiel was hanging out with other exiles by the river Chebar, in Babylon, when he sees this incredible vision of the heavens opening. Out of the north comes a storm with weird creatures and a chariot. It was kind of psychedelic; read the first chapter of Ezekiel to get the idea of what he experienced. Overwhelmed, he falls on his face, which is a proper response if you ever find yourself face to face with the Almighty. Bow down, duck, hide! Don’t hesitate, or you may be french-fried! With his face in the ground, Ezekiel hears the command, “Mortal, stand up.” Many versions use the more literal translation, “Son of man.” Either way, Ezekiel is identified for who he is: a man, a mere creature, one with limited powers. He’s just like you and me. God never goes out and finds the strongest man to do his bidding. Ezekiel is weak; he can’t get up even though he is being commanded to do so. It’s only when God’s spirit enters him that he’s lifted up, placed on his feet, and is able to hear his calling. Ezekiel is called to speak to his people. He’s called to address those who have rebelled against God. Ezekiel doesn’t even have the pleasure Jonah did, of going and pronouncing doom on Israel’s enemies. His message, like Knox, is to his kinfolk, his family, and his neighbors. He won’t be very popular. He may even be considered a traitor. But that is the calling God has for him. That is what God needs him to do. Notice, too, unlike Jonah who feared that Nineveh would hear his message and repent, there is nothing suggesting this is going to happen to Ezekiel. The prophet is essentially told that he may not be listened to. The way God will evaluate Ezekiel’s faithfulness isn’t by how many converts he gains or how big of a following he has. Ultimately, what is important isn’t how much of a change Ezekiel’s words make in people’s lives, but how faithfully he proclaims them. Ezekiel is warned that he may not be liked (after all, these are people who are in rebellion against God), but regardless, he’s to give the message. It’s not his message, its God’s. Although Ezekiel is given a tough assignment, God is going protect Ezekiel in order to make sure that the message gets through. With Jeremiah, who was a prophet back in Jerusalem while Ezekiel was working in Babylon, God’s protection may appear dubious (after all, Jeremiah was thrown in a well). In Ezekiel’s call, his hearers will be mad, but the prophet is going to be protected. One scholar points out that a better translation of this passage isn’t to see briars and thorns and scorpions as a part of the angry crowd. Instead, they protect Ezekiel. The Prophet will be like “Brer Rabbit,” happily running through thorns to escape those who would harm him. Or maybe he’d be like Paul, five centuries later, who survived his persecutors in Damascus by being let out of a window and lowered outside the walls in a basket. Or consider Stephen, the guy Paul watched being stoned. God never promises us an easy time! After all, Jesus’ call is to take up our cross and follow. Although those who hear Ezekiel may not like what he has to say, God will see to it that they get the message so that they will know that a prophet has been among them. As one commentator on this passage points out, one of the common characteristics of a call in the Old Testament is some impediment of the one called. 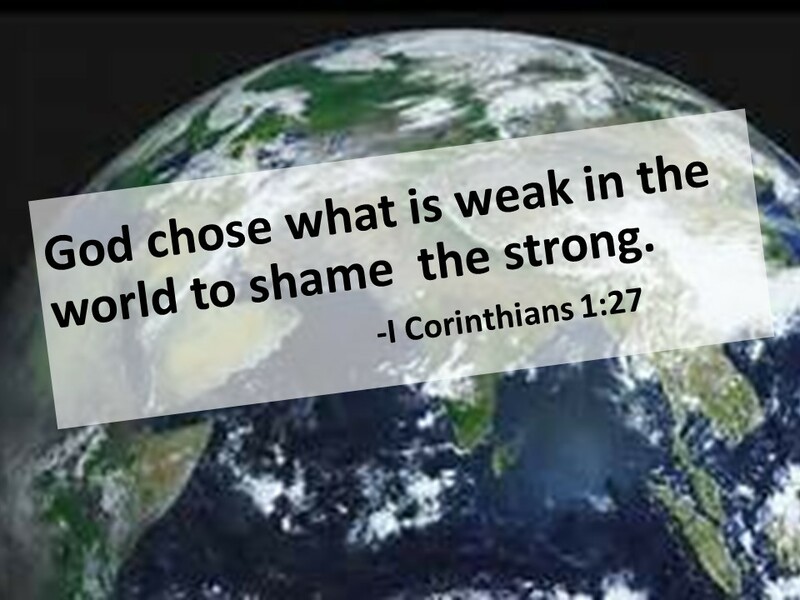 Moses stuttered, Gideon was considered a weakling, and Isaiah had unclean lips. But in all cases, God is the one who makes the difference. Here, with Ezekiel, we see that this prophet-to-be can’t even stand up. But as the quote that’s attributed to Knox goes, “a man with God is always in the majority.” Ezekiel’s task is to take a message to a less than enthusiastic crowd. It’s only with God’s help that he is able to deliver. Another commentator, working with this passage, made this observation: “Certainty of call can be a wonderful thing, but certainty of call can also be a terrible thing.” When we feel God is calling us to a task, especially one like this, we have to be careful. Is it God giving us the strength to carry it out? Or is it our own ego? The call of God should always humble us. Ezekiel is called to take a message to the Hebrews who are in exile, to help them theologically deal with the fall of Jerusalem and the destruction of the temple. It’s not an easy assignment. No one likes hearing that they (and their disobedience) are the cause of their current troubles. Think about us, as a nation. How often do politicians and political pundits want to blame someone or something else for the nation’s woes. “It’s the other side that’s the problem!” we hear over and over again. “We’re not to blame.” Such rhetoric doesn’t help us solve the problem. 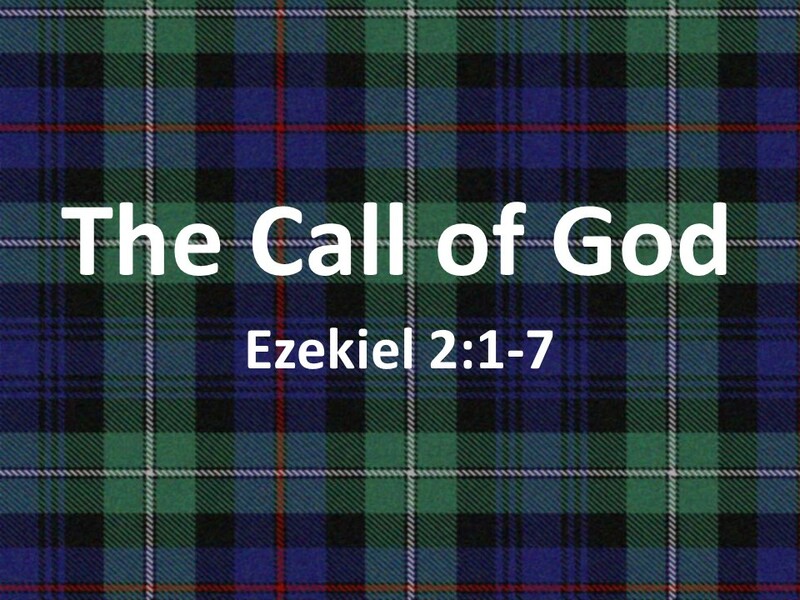 Ezekiel’s call was to help shape God’s people as they come to understand their responsibility for God’s judgment. We should consider Ezekiel’s calling. We need to remember that like him, we’re not out to win a popularity contest. We’re to seek out what God’s will is for our lives. For our Elders, many of whom marched in our morning procession, they’re also to seek out God’s will for our congregation’s life. In the end, we’ll be judged not on how many people liked us or on how elegant our words have been or even how many converts were made under our leadership. We’ll be judged on how faithful we have been to God’s word and to his work. I am sure when Knox set sail for Scotland in 1559, he had no idea the impact his ministry would have on the Church in Scotland. And it continued on to Ireland, and in the Americas and Australia and New Zealand. Knox work continues to influence the church in places like the Sudan and Malawi, Brazil and Korea… As John heard in his vision on the Isle of Patmos, “Blessed are the dead who die in the Lord, says the Spirit. They rest from their labors, and there works follow them.” The impact of Ezekiel’s words are still felt thousands of years later and Knox’s work is still bearing fruit nearly 500 years later. According to the ways we think, Ezekiel was an unlikely candidate for a prophet. He wasn’t even strong enough to stand before God. He had to be given the energy to get up. He was humble. Likewise, Knox was an unlikely candidate for a Reformer. He was a marked man and had a babe in arms. But God called both Ezekiel and Knox. Don’t ever think that God can’t use you because you are weak, because you are not elegant with speech, because you are not religious enough, or because you have other obligations. Those are the kind of people that God uses to make a difference in the world. Are you open to God’s call? Amen. Pastor: ALL THINGS ARE GOVERNED BY THE PROVIDENCE OF GOD. Pastor: WE ARE ELECTED OR PREDESTINATED IN CHRIST. Pastor: WE ARE ELECTED FOR A DEFINITE PURPOSE. Margaret S. Odell, Ezekiel (Macon, GA: Smyth & Helwys, 2005), 40-43, 50. Daniel C. Fredericks, “Diglossia, Revelation and Ezekiel’s Inaugural Right,” Journal of the Evangelical Theological Society (June 1998). This is taken from the Second Helvetic Confession, Chapter X. 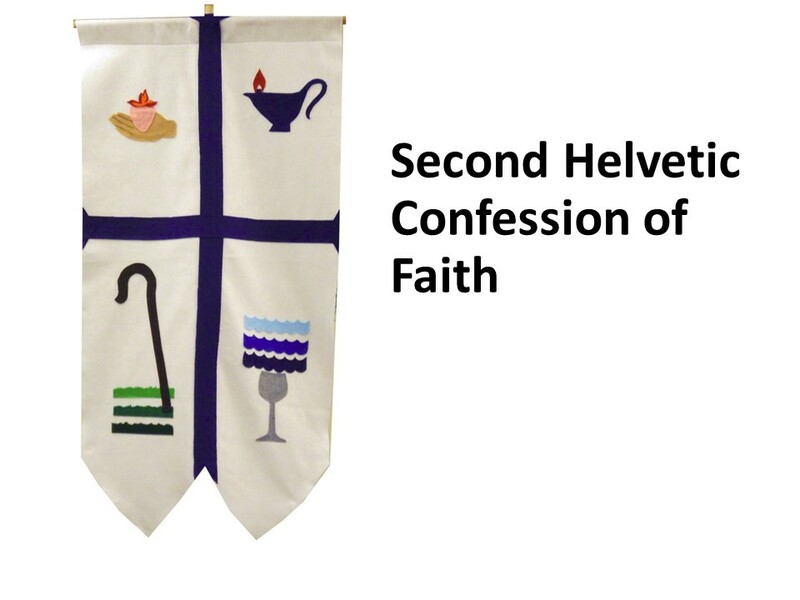 See Presbyterian Church USA, Book of Confession, (Louisville, KY, 2004), 5.052-5.054. Very good Kirkin’ Sunday sermon. In all the many Kirkin’ sermons I have heard that was the best. 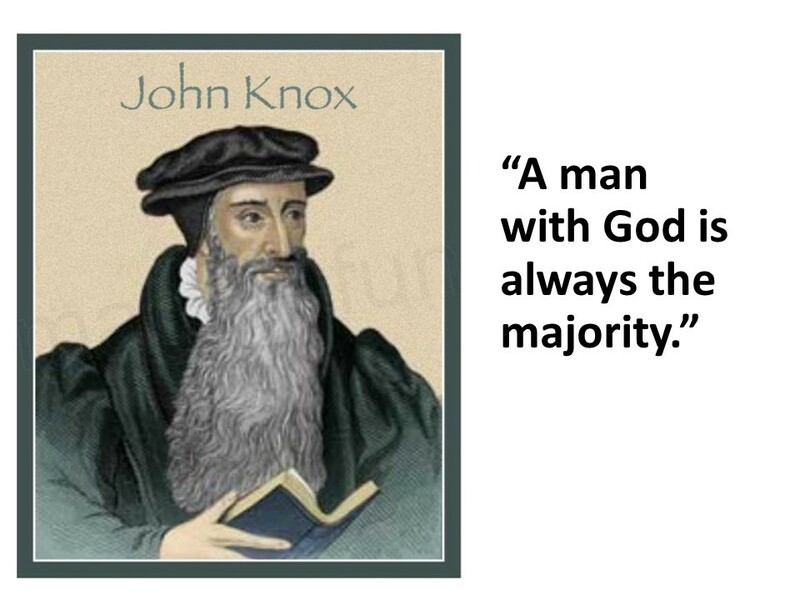 As a matter of fact, I don’t recall any preachers even mentioning John Knox and he played quite a role, wouldn’t you say. Thanks.